Best Price Photo, online at BestPricePhoto.com, is a wholesale distributor to the public. Best Price Photo offers digital cameras, camera accessories, lenses, projectors, TVs, home entertainment, computer accessories, headphones, and other consumer electronics for less. By buying straight from manufacturers, Best Price Photo is able to supply customers with great products at the best prices. 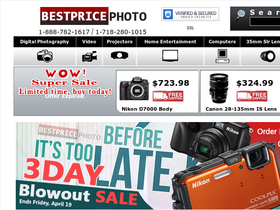 BestPricePhoto.com carries brands like Nikon, Sigma, Canon, Panasonic, Olympus, Fujifilm, Apple, Epson, Sharp, Sony, and others. So enjoy great deals on photography and entertainment, and be sure go get all the latest BestPricePhoto.com discounts, Best Price Photo promotions, and Best Price Photo coupon codes found here at RetailSteal.com. Best Price Photo ships in the United States and internationally. Shipping charges are based on weight, value, and destination. See site for more information. Go to Best Price Photo and save $25 on purchases to save on Kodak, Panasonic, Pentax, Canon, and more. Use code on orders of $1000+ to save. Save $15 on your purchase of $500 or more at BestPricePhoto.com. Click here and use coupon code. Take $10 off your purchase of $300 or more at Best Price Photo. Click here to shop and use coupon code to save on Canon, Nikon, Sony, and more. Receive a free lens cleaning kit with your purchase and this coupon code at Best Price Photo. Click here to shop. Shop at BestPricePhoto.com and enjoy free shipping on many products. Click link to shop. Shop at BestPricePhoto and find Canon digital point and shoot cameras for as low as $115. Click here to shop. Shop at Best Price Photo and save on cameras and camera accessories in the Closeout Deals Section. Click here to go there now. Shop at Best Price Photo for Panasonic camcorder for as low as $549. Click here to get started.